Get ready for a journey that's rich in culture, history and ancient tales of mystery and intrigue. This once-in-a-lifetime 14-day package takes in two iconic countries, Lebanon and Cyprus, and visits some of the oldest cities in the world, along with mountain villages, churches, souks, Roman sites and more. If you're looking for a taste of adventure with a touch of luxury in the Middle East, this trip is for you. Enjoy guided tours of Beirut, Nicosia and Tripoli; visit Byblos, one of the oldest continuously inhabited cities in the world; admire the stalactites and stalagmites formations of Jeita Grottos; explore the old city of Sidon and its souks; enjoy a wine tasting in the Lebanese countryside of the Bequaa Valley; explore the beautiful reception halls of the historical palace of Beitddine; discover Choirokoitia Archaeological Site, a UNESCO World Heritage Site; see Angeloktisti, the 6th century Byzantine church; enjoy Mount Olympus, the highest point in Cyprus; visit the Kykkos Monastery, dedicated to the Virgin Mary; walk through a majestic cedar forest; see Roman and Byzantine sites in Tyr; and experience Petra tou Romiou, the very spot where Aphrodite was said to emerge from the foaming waves. 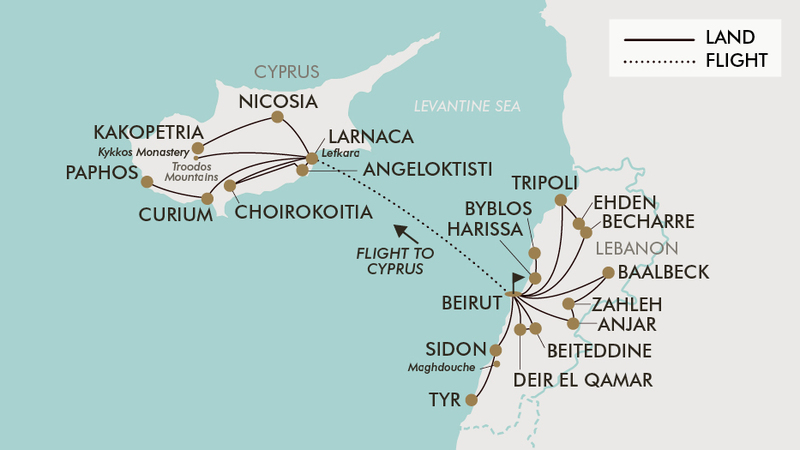 This incredible tour includes return international flights, an additional one-way flight from Lebanon to Cyprus, 11 nights 4-star hotel accommodation, 11 meals and much more. Today depart from either Sydney, Melbourne, Brisbane, Adelaide or Perth for Beirut, Lebanon. Fly with Etihad Airways, Emirates, British Airways, Singapore Airlines or Cathay Pacific to name a few (subject to availability). Upon arrival into Beirut be met at the airport and transferred to the hotel. After breakfast, enjoy a visit to the Jeita grottos, one of Lebanon’s natural wonders, where you will enjoy views of stalactites and stalagmites formations dating back thousands of years. Later drive to Harissa (the lady of Lebanon) where you will visit the historical Maronite Church (1904) which is dedicated to the Virgin Mary (600m above sea level) and enjoy the panoramic view of the small city of Jounieh. Continue to the historical city of Byblos, considered to be one of the oldest continuously inhabited cities in the world (7000 years old). After lunch (not included), visit historical monuments and an archaeological site dating back to the prehistoric period (5000 B.C.). See the remains from the Phoenician, Roman and Crusaders periods, including temples, a royal necropolis, ramparts and a crusader fortress. In the late afternoon, drive back to Beirut for a guided tour of the historic centre. Today head south to visit the historical Phoenician cities of Sidon and Tyr (Sour). The first stop is the city of Sidon, where you will visit its historical monuments, including a Crusader sea castle (1227 A.D.), old souks and a soap caravan serai. After lunch (not included) continue to the city of Tyr (Sour), the imperial Phoenician city listed as a UNESCO world heritage site, where you will visit two historical sites dating back to the Roman and Byzantine periods including the hippodrome, Roman bath and a necropolis. On the way back to Beirut you will visit a religious sanctuary dedicated to the virgin Mary in the village of Maghdouche, where there is a small church which was originally a cave where the virgin Mary stayed for three nights while Jesus was preaching to the pagan people in the city of Sidon. Today depart towards Tripoli, the second largest city in the country, where you will visit the authentic oriental city with its historical monuments including old Mosques, Turkish baths, old souks and bazars. Afterwards drive up to the northern mountains via the village of Ehden where you visit the monastery of St Antonios Kozhaya which hosted the first Arabic printing press in the 17th century. Continue to the village of Becharre, the home town of the Lebanese philosopher and painter Jibran Khalil Jibran. See the Kadisha Valley, nicknamed the Valley of the Saints, due to the early host of Christians and their monasteries. Visit one of Lebanon’s famous cedar forests (2000m above sea level) and walk between the majestic trees, which are also known as biblical trees or the cedars of the lord as they are very old and remain green all throughout the year. Drive back to Beirut. After breakfast, depart towards the Bequaa Valley, the largest agricultural plain in Lebanon situated at an average altitude of 900m and between two mountain ranges, to visit the famous city of Baalbek or Helipolis as Alexander the Great named it in 333 B.C. Today it has the three largest roman temples in the world (Jupiter, Bacchus and Venus - listed as UNESCO world heritage sites). Afterwards continue to Zahleh in the Bequaa Valley well known due to its riverbank restaurants and the agricultural fields surrounding it, especially the vineyards. Visit one of the historical wineries - Ksara (1857) and enjoy a wine tasting. Later drive to the Armenian village of Anjar for lunch (not included). Nearby is a natural water spring where you will visit a world heritage archaeological site which dates back to the Ummayad Islamic period. In the late afternoon, return to Beirut. Today, you will visit the historical palace of Beitddine (19th century) which was built by the Lebanese prince Emir Bachir Chehab (Bachir II). Explore the beautiful wooden decorated reception halls, the Turkish bath and the Roman and the Byzantine mosaic museum. Afterwards, you will see the picturesque village of Deir El Qamar which for over 300 years was the headquarters of the Lebanese princes who ruled Mt. Lebanon from the 16th to the 18th century. After lunch (not included), drive back to Beirut and visit the national museum. After breakfast, check out from the hotel and be transferred to the airport for your flight to Cyprus. Upon arrival you will be transferred to the hotel. Enjoy the rest of the day free at leisure, in the beautiful port city on the south coast of Cyprus. Today, you will visit some important sights in Larnaca including: St. Lazaros Church, Larnaca Palm Tree Road and Hala Sultan Mosque. Afterwards, drive to Choirokoitia Archaeological Site, a UNESCO World Heritage Site. The site provides an insight into human life during Prehistoric times. Next you will visit Angeloktisti, a Byzantine church which dates back to the 6th Century. Later visit the Lefkara Village, famous for its silverware and intricate handmade lace, known as “Lefcaritika”. After breakfast, enjoy a guided city tour of Nicosia, the capital of Cyprus, which is divided into the North (which has been occupied by the Turkish army since 1974) and the South (which is under the control of the Republic of Cyprus). You will visit Laiki Yitonia and the narrow streets of old town. Later, visit the Archaeological Museum which gives you an insight into the island’s rich history. Afterwards the tour takes you to the Green Line. The Green Line divides the country into two parts and is always manned by UN forces. Next visit the Archbishopric and the famous Cathedral of St. John. Then you will drive to Kakopetria. The village of Kakopetria is a beautiful traditional village located 55kms south west of the capital, Nicosia, on the foothills of the Troodos Mountain. It stands at an altitude of 667m and is the highest village in the Solea Valley. You will visit the old Kakopetria area, with the stone paved roads and the well-maintained traditional Cyprus houses. Then visit Panayia Podithou Church, built in 1502, this 15th century church is located near the village of Galata and the church of Archangel Michael at Galata Village. Continue to Panagia Assinou Church, this 12th century church is located in the village of Nikitari and features excellent examples of wall paintings. Today you will discover the legends and history of one of the most beautiful areas in Cyprus - Aphrodite’s birthplace. The day begins with a visit to Curium, an impressive Greco-Roman site, which includes mosaics and a superb theatre before heading to Petra tou Romiou, the very spot where the legendary goddess of love emerged from the foaming waves. Once in Paphos, you will see the 3rd century houses of Dionysos, where you can admire the excellent mosaics which depict familiar scenes from mythology. Then see the catacombs of Ayia Solomoni, the Byzantine castle of forty columns and St. Paul’s pillar. Afterwards enjoy a stroll around the picturesque harbour before driving back to Larnaca. After breakfast today you will discover the Troodos Mountains – the Green Heart of Cyprus. A memorable ride off the beaten track through idyllic mountain villages unchanged for generations. The first stop will be just below the peak of Mount Olympus - the highest point in Cyprus at 1951m to take in the spectacular panoramic views. Continue to “Throni” to see the Tomb of Archbishop Makarious III, the first president of Cyprus. Enjoy the spectacular view of the countryside and the pine forest. Drive to the Kykkos Monastery, which was built in 1080 and dedicated to Virgin Mary. It houses one of the three surviving icons painted by St. Loukas. On the way back to Larnaca visit the village of Omodos and the Holy Cross Monastery. Tonight take the chance to join an optional Cyprus Night experience (not included). Enjoy great entertainment in true Cypriot style, including an amazing floor show of Greek and Cypriot folk dancing and music, which you will surely be tempted to join in. You will be served a typical Cypriot Meze, which consists of innumerable little delicacies which form a very satisfying and complete meal. After breakfast you will be transferred to the airport for your return flight back to Australia. Please note: if your flight departs early, breakfast will be arranged for pick up from the hotel reception the night before. Travel offer is valid for travel on selected dates until the 1st November 2019. For solo travellers a mandatory single supplement of $690 applies. Etihad Airways, Emirates, British Airways, Singapore Airlines, Cathay Paci c, Virgin Atlantic, Lufthansa, Swiss Airways, Austrian Airlines, Scandinavian Airlines, Qatar Airways, Air France, KLM, Finnair, Virgin Australia, Thai Airways, Korean Airlines, Malaysia Airlines, China Southern Airlines, China Eastern Airlines, Turkish Airlines, Oman Air, Garuda Indonesia, Vietnam Airlines, Air China, China Airlines, Malindo Airlines plus any codeshare partners (subject to availability). - Beruit, Lebanon (Pre Tour): $145 per room including breakfast. - Larnaca, Cyprus (Post Tour): $290 per room including breakfast. Minimum group size 20, maximum group size 50 per vehicle. The average temperatures in September are between 24°C and 31°C, with exceptional possible peaks as low as 16°C and high as 36°C as observed in previous years. In October Lebanon and Cyprus are influenced by the interior Mediterranean climate so the weather is still nice and warm. October is a great month to visit Cyprus, the temperature remains quite hot in Cyprus during October, more specifically in Paphos with highs of around 26.7 ºC and 10 hours of sunshine. Both Lebanon and Cyprus temperatures usually cool off during November, but nonetheless remain on the warm side. The daytime temperature rises to an average maximum of 22°C and falls to an average overnight minimum of 13°C. Gratuities (tips) are not included in the tour price for services of the tour leader (when available) and driver throughout the tour. Tipping is optional at the customer's discretion. A tourist visa is a strict requirement if travelling on an Australian passport. Travellers who only need a single entry visa may be eligible to get a visa on arrival for a stay of up to 30 days. A tourist visa is not required for a stay of up to 90 days per 180 days however traveller must hold a passport valid at least six months on entry with two blank visa pages.